Left-wing activists in California protested Republican Rep. Jeff Denham’s Q&A at a Modesto Latino Community Roundtable luncheon Tuesday. Denham spoke to the Latino group about immigration, farming, and a variety of issues raised by the group. A dozen left-wing groups, including Democrat socialists, organized the protest against Denham, according to a release by Lisa Battista, vice president of the Modesto Progressive Democratic Club. Video of the protest posted by the Modesto Bee showed just less than a dozen protesters at times yelling competing messages and other times in unison chanting familiar leftist chants, such as “No Trump, No KKK, No fascist USA.” The report stated there were about 50 protesters, though it appeared far fewer were shown in the video. 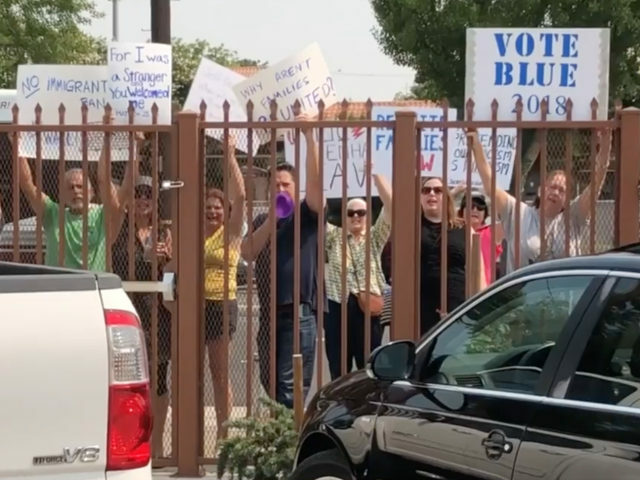 One sign read, “Resist hate and racism” with the image of a fist, another read, “Vote Blue 2018,” and others focused on immigration and illegal aliens separated at the border. The Republican legislator told the Latino roundtable group that immigration reform legislation will take both parties working together and that he would not give “false promises.” He pointed to legislation he authored to help give U.S. citizenship to foreign nationals who have served in the U.S. military. Activist organizer Battista told the Bee she was satisfied with Tuesday’s protest turnout. She met with the editor of the Bee in June and encouraged members of the Modesto Progressive Democrats to head to the meetup with a group from the Bee. Battista briefly ran to oppose Denham in the 2018 primary, but in January, she moved to support TJ Cox in the race. Cox also dropped out. Denham held a commanding lead in California’s June top two primary elections. He won 37.5 percent to the number two candidate, Democrat Josh Harder, who won 17 percent. The two Republican candidates in the primary pulled in a combined 52.1 percent support compared to the 47.9 percent combined pulled in by the six Democrats in the race.